MULTI-FUNCTIONAL! 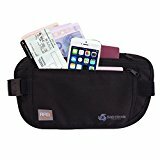 – Make your trip abroad a breeze with our multi-functional and stylish money belt! Our product features zip pockets designed to keep travel documents, cards and cash safe when out and about! ULTIMATE COMFORT! – Each money belt has a stretchy waist band and compact pouch, making them comfortable to wear with any holiday outfit! They’re also made of breathable materials making them suitable to wear over or under clothing. SAFETY FIRST! – With safety at the heart of our product, we ensure that your personal belongings are not only protected from pick pockets, but they also have built in RFID protection which prevents your card details being stolen by machines. GREAT VALUE! – There’s a small price to pay for the safety and comfort benefits of our money belt, compared to the possible losses of stolen documents and cash. SMALL BUT EFFECTIVE! – It may look simple, but a well made, multi functional and stylish money belt is the compact accessory any traveller needs! Click to add to cart now to enjoy a stress free holiday! No holiday is complete without spending money, but it can be a worry when travelling with large amounts of cash. Not to mention vital items like passports and boarding passes! That’s the reason we’ve designed our money belts with safety and comfort in mind. They’re made of the best breathable materials, allowing you to wear them under or over clothing comfortably for as long as required! Each money belt has compartments for all your necessary travel accessories – passports, boarding passes, cards and cash – protecting you from pick pockets and avoiding the need for carrying a heavy shoulder bag or handbag. Our product is long lasting, great value and a stylish accessory to carry with you wherever you go! The compact, modern design and plain black material make our money belts unisex and suitable for all ages. The adjustable strap is so comfortable you can wear it all day! It’s a great way to be hands free and access your most important possessions quickly and easily! The most important feature of our money belt is the sophisticated RFID protection that’s built in to stop your card details being stolen by people with machines. With so much to consider when planning a holiday, take a weight off your mind and order a money belt today! Click ‘add to cart’ now!